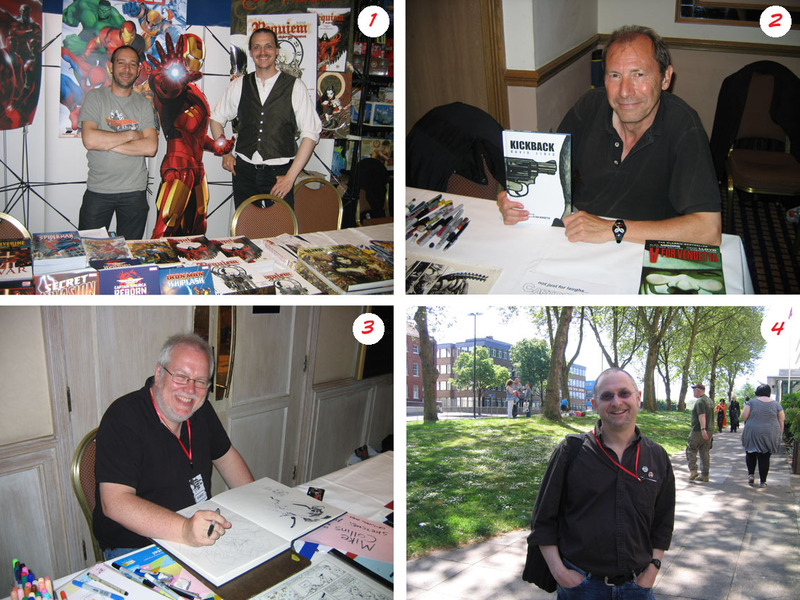 Being stuck in a hotel on the hottest weekend of the year doesn't sound very enticing but the Bristol International Comic & Small Press Expo was such an enjoyable and laid back event that it was worth a bit of vitamin D deprivation. 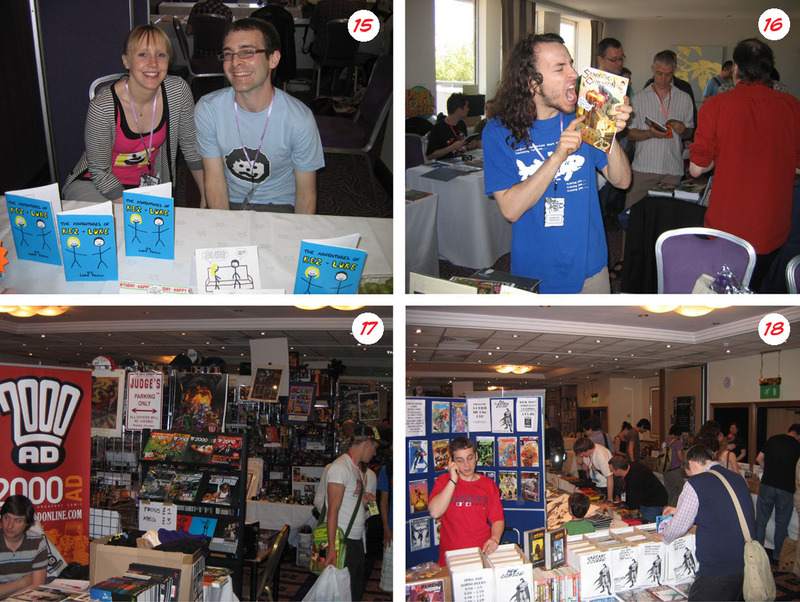 1: Panini UK editors Simon Frith and Brady Webb had an impressive display of Panini Books and comics on their table. 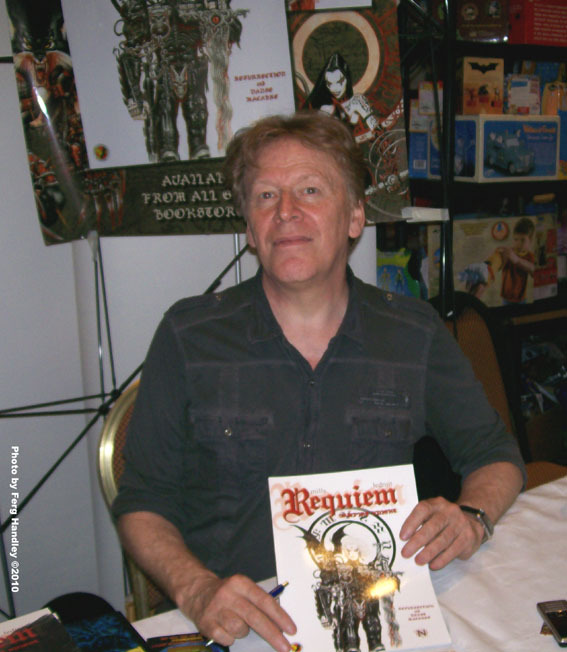 The biggest demand was for the first two volumes of Requiem by Pat Mills and Olivier Ledroit. 2: V for Vendetta artist David Lloyd promoting his crime noir graphic novel Kickback, a fine all-new book that everyone should buy. 3: Mike Collins, artist on Doctor Who Magazine, working all weekend as usual providing sketches for a legion of fans. 4: Writer John Short, who wrote Rex and Robin Hoodie for Toxic, enjoying the sun on the short walk to the small press expo at the Mercure Hotel. 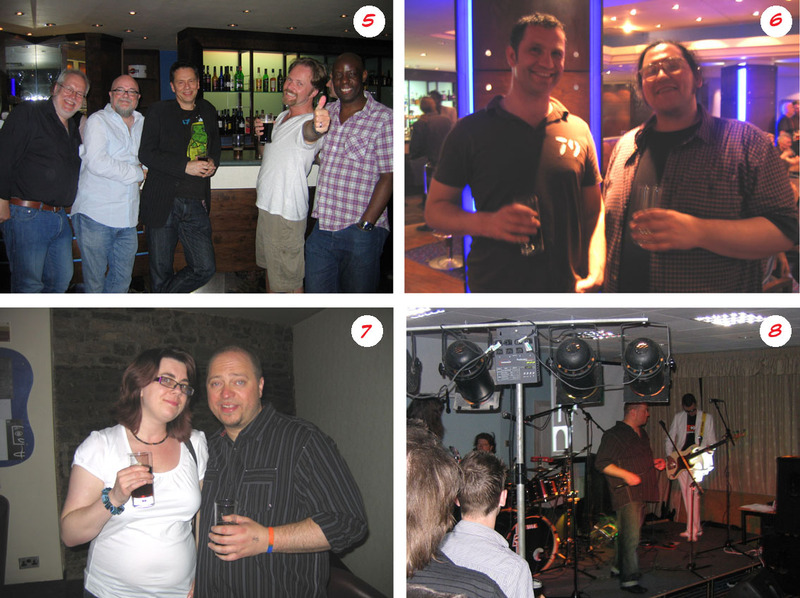 5: In the bar of the Ramada Hotel on Friday night it was a reunion of Marvel UK creators. Left to right: Mike Collins, Richard Starkings, Dave Hine, Ian Churchill, and Doug Braithwaite. 6: Artists Rob Davis and Faz Choudhury use their combined mental powers to prevent my camera flash from working. 7: Artist/writer Laura Howell with Smallzone's Shane Chebsey. Shane is also one of the organizers for the October event BICS. 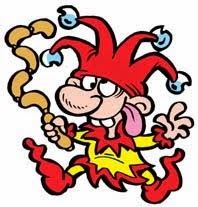 8: Gee, they got a band! Mine Power Cosmic rock the house on the Saturday night. 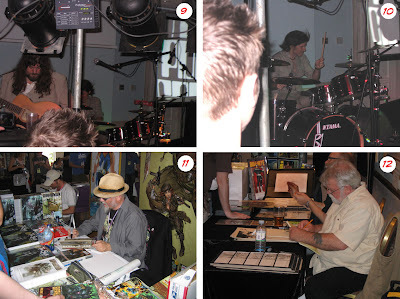 10: ...whilst on the drums it's Walking Dead artist Charlie Adlard (that's the title of the comic Charlie works on, not his physical state by the way). 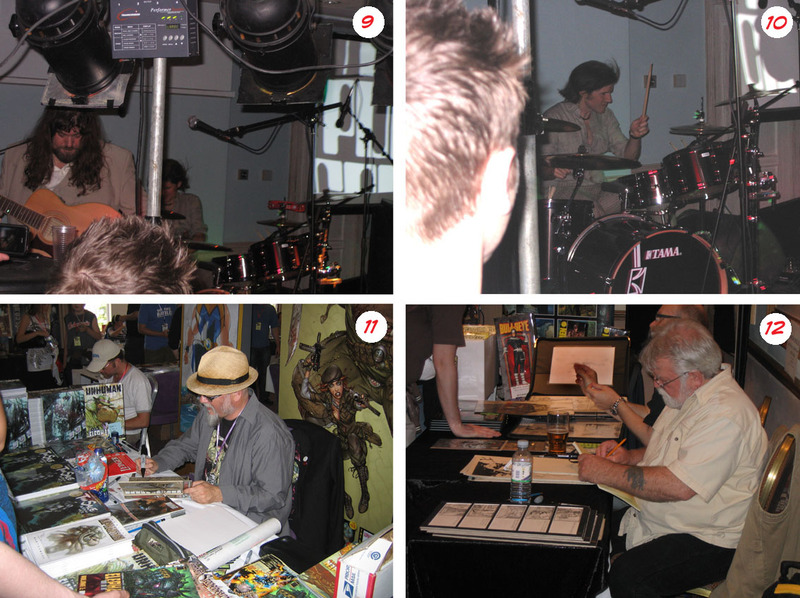 11: Creator of Elephantmen, Richard Starkings flew over from L.A. as a special guest. 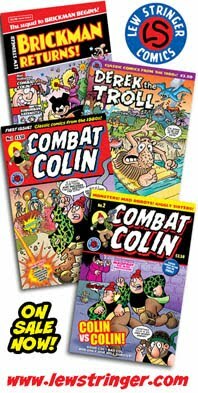 It was great to see Richard again, who had been my editor on Combat Colin 20 years ago and, more recently, my editor on Brickman Begins and the Brickman back-up series in Elephantmen. 12: The brilliant Mike Ploog (Werewolf by Night, Man Thing, and other classic 1970's Marvel monster books) sketching for fans. 13: Doug Braithwaite, superb artist on Justice and now Thor, was also busy all weekend sketching for fans. 15: It's Kez and Luke out of The Adventures of Kez and Luke, produced by Toxic's sub-editor Luke Paton. 16: Those zany small-pressers! Tom McNally with the current issue of his comic Semiotic Cohesion. 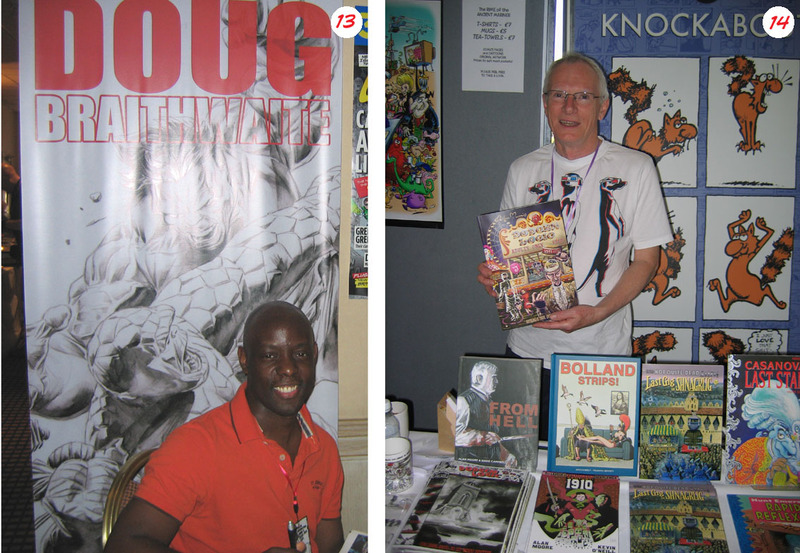 17 and 18: Scenes around the dealers' room at the Expo. 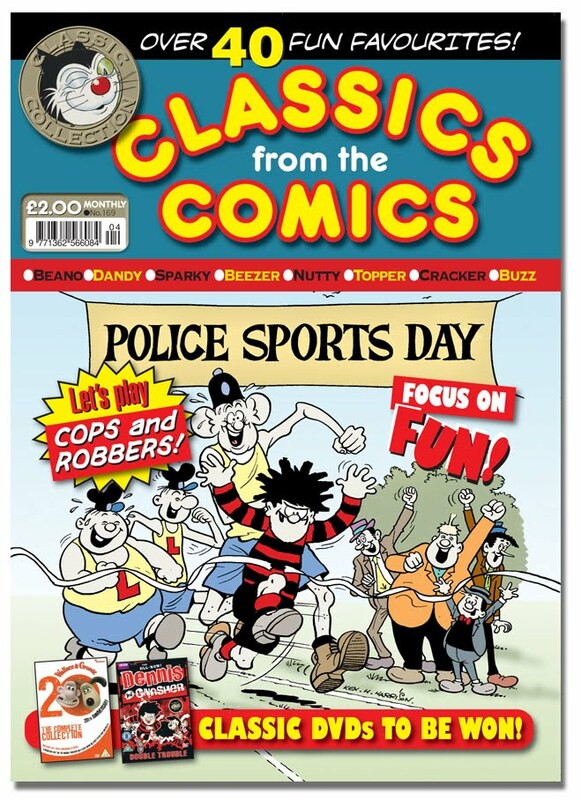 The team behind Comic Heroes magazine were apparently at the Expo but as issue one has sold out and they had no stock to bring! 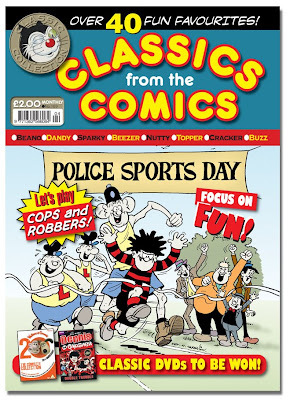 However there was a preview of the second issue's cover at the show. 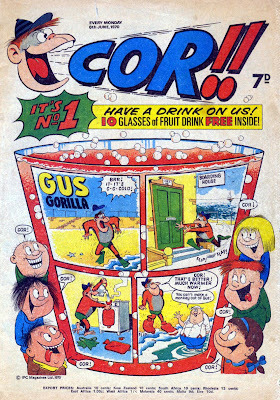 Amongst the contents of the next issue I've contributed a brief history of UK humour comics. 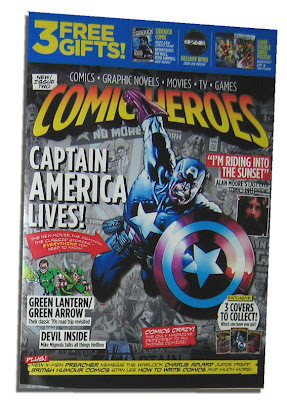 Comic Heroes No.2 will be out in mid-June. 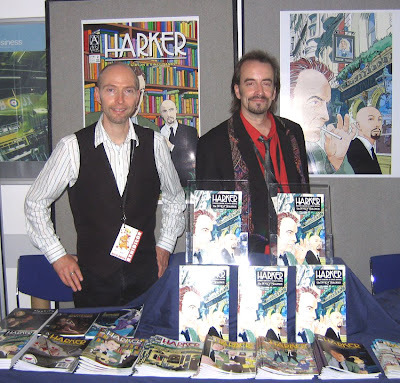 Thanks again to Mike Alwood and the other organizers for another brilliant Bristol Comic Expo. I hope you enjoyed it as much as the rest of us clearly did! The next UK comic event is the London MCM Expo this coming weekend. Unfortunately I'm unable to attend now for various reasons but I'm sure it'll be a great show! 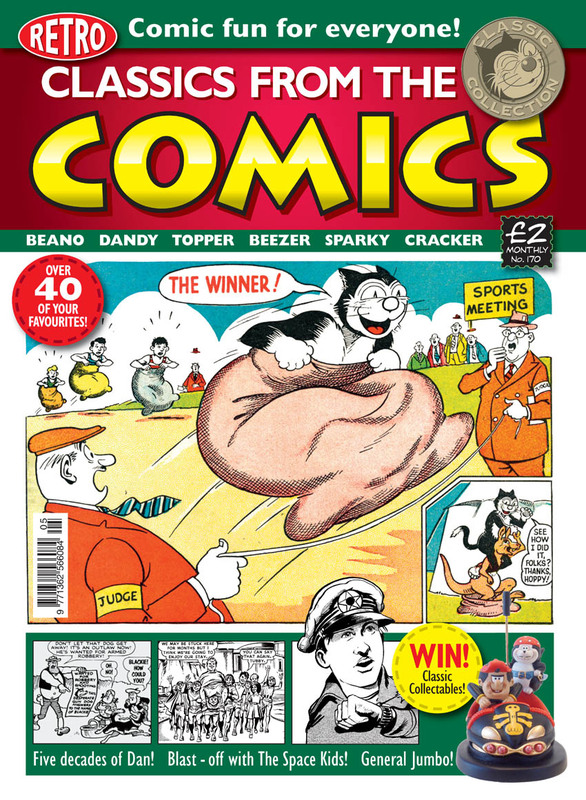 D.C. Thomson's monthly reprint publication Classics from the Comics gets a facelift this week with a new logo, cover design, and new features. 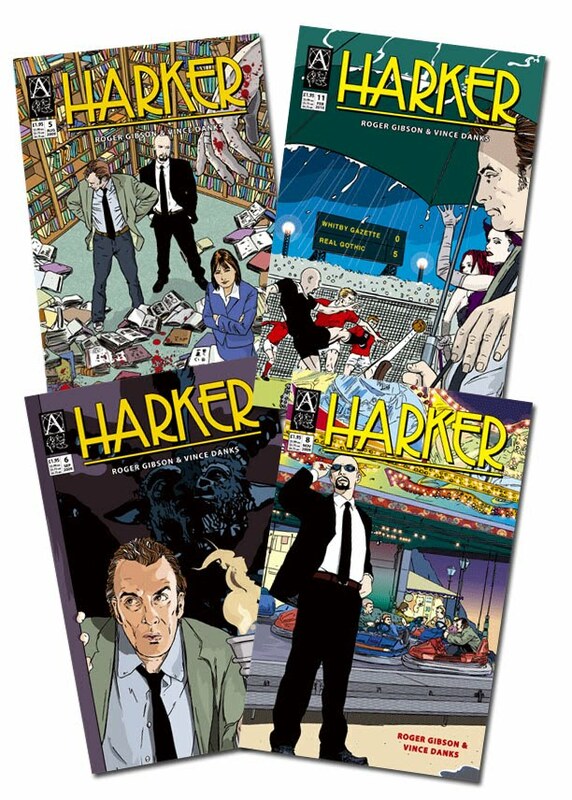 Sadly this means the end of Ken Harrison's covers (the only brand new artwork in the comic) but they've been replaced with a design which reflects the retro contents. 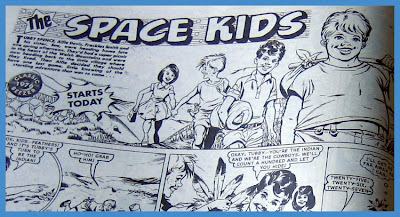 Within the 68 pages of issue 170 are a variety of classic strips including Ken Reid's Jonah, Bill Holroyd's Brassneck, Davy Law's Dennis the Menace, and a "new" reprint, The Space Kids, a 1976 adventure series from The Beezer drawn by Ron Smith. 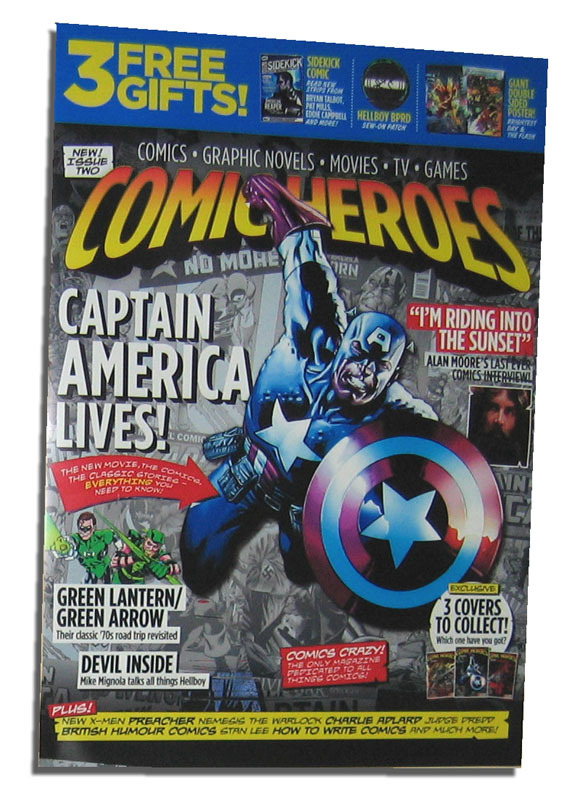 Another new item this month is the debut of News and Views featuring readers letters and a plug for comic websites. 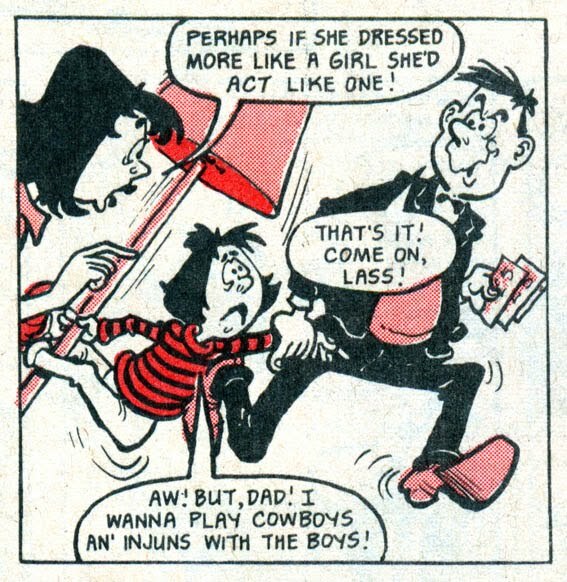 There's also a feature on Desperate Dan, showcasing Dudley Watkins strips from the 1940's to the 1980's, although the 1975 one is a Sixties reprint. 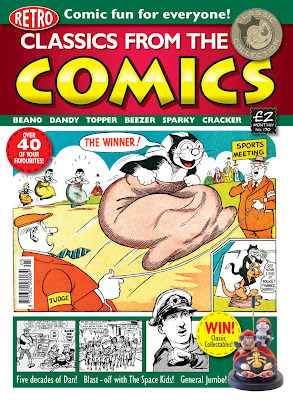 With its brighter and better design, Classics from the Comics No.170 goes on sale this week, priced £2. Its distribution is poor though so if it's not available in your area you can subscribe at this link. 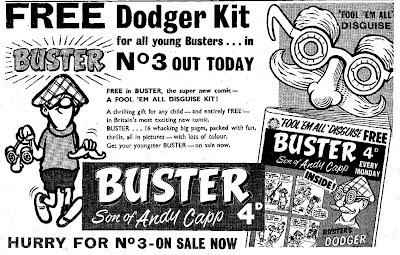 Fifty years ago this weekend, Fleetway Publications launched the first issue of a brand new comic that would give D.C. Thomson's Dandy and Beano a run for their money for four decades. 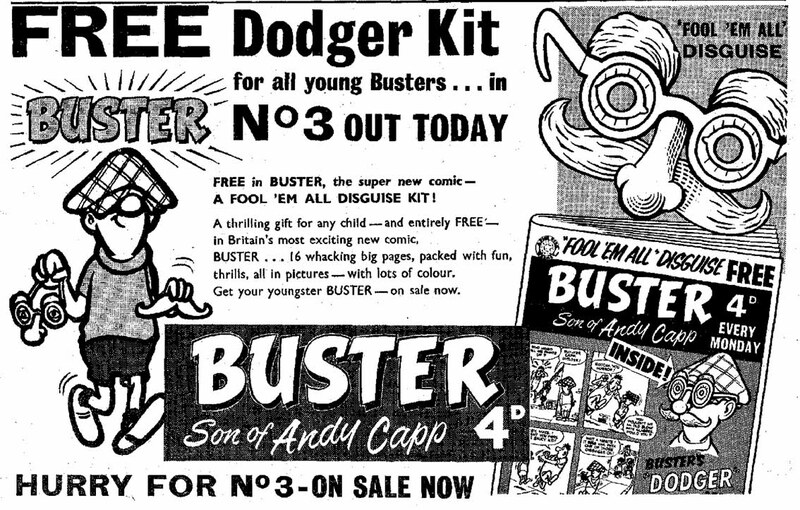 Buster, Son of Andy Capp had arrived! 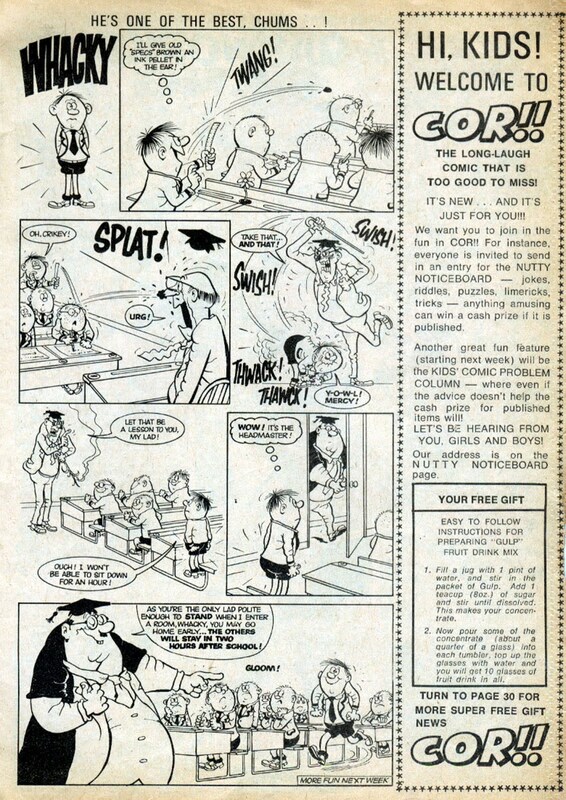 The new comic both gave a nod to the past (tabloid size) and heralded the future in that it was distinctively more modern looking and faster paced than the bygone days of Illustrated Chips and Comic Cuts. 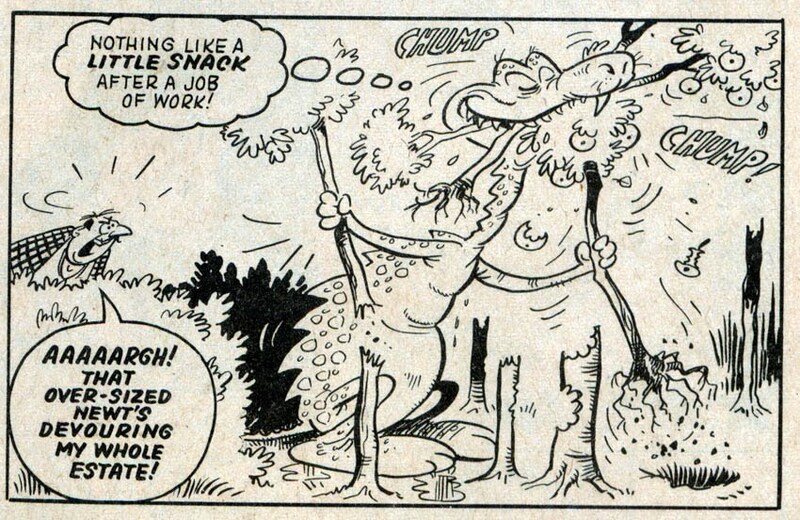 This was a bold new direction to immediately establish that Fleetway were going to be more contemporary than their predecessors Amalgamated Press. 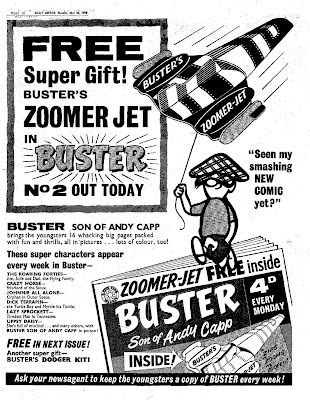 As seen by the ad above, issue No.1 officially launched on Monday 23rd May 1960, although there were copies on sale two days earlier on Saturday 21st May. Buster (as it would be known, when the Andy Capp references were dropped a few months later) featured a good balance of both humour and adventure strips. The old A.P. practice of including text stories was not evident in this new venture. With the rise of Television, visual storytelling was the way to go. 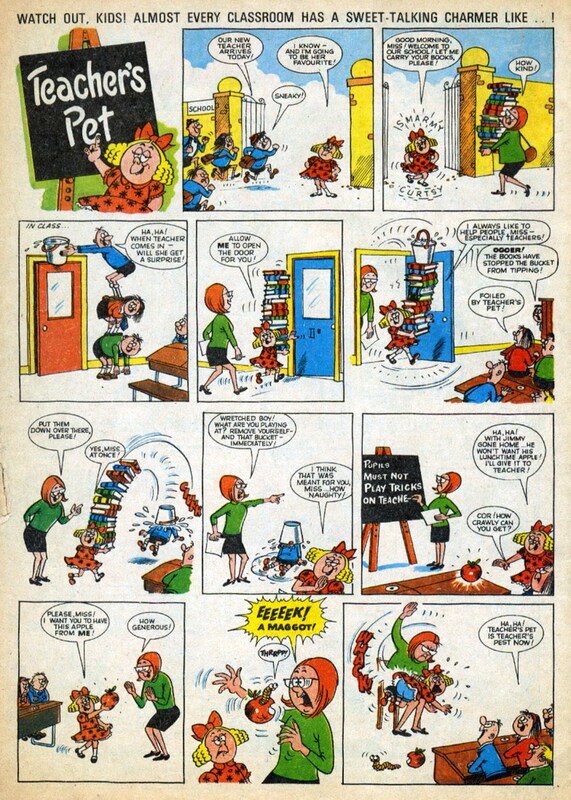 As fans of the comic will know, over the years Buster shrank its dimensions to the standard size (whilst increasing its page count) and gradually phased out its adventure strips to become part of the IPC Humour Group. 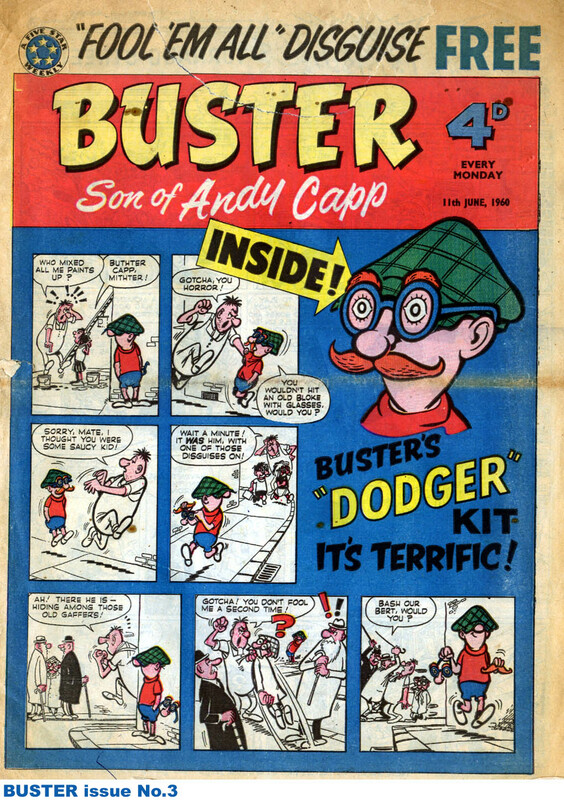 In the course of its 40 years Buster absorbed many other titles, become an all full colour comic and, sadly, by the final issue in December 1999 had become all reprint. 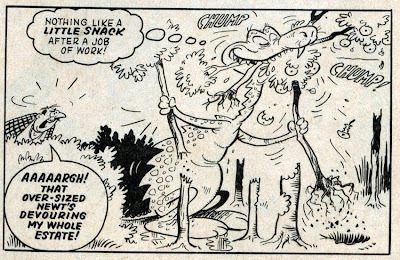 The comic that had begun a new direction for Fleetway in 1960 had become the last surviving title of the traditional IPC funnies. 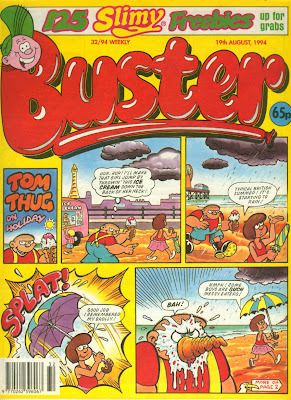 With no other comics of its type to merge into, and with sales falling, Buster simply ceased publication at the end of 1999. 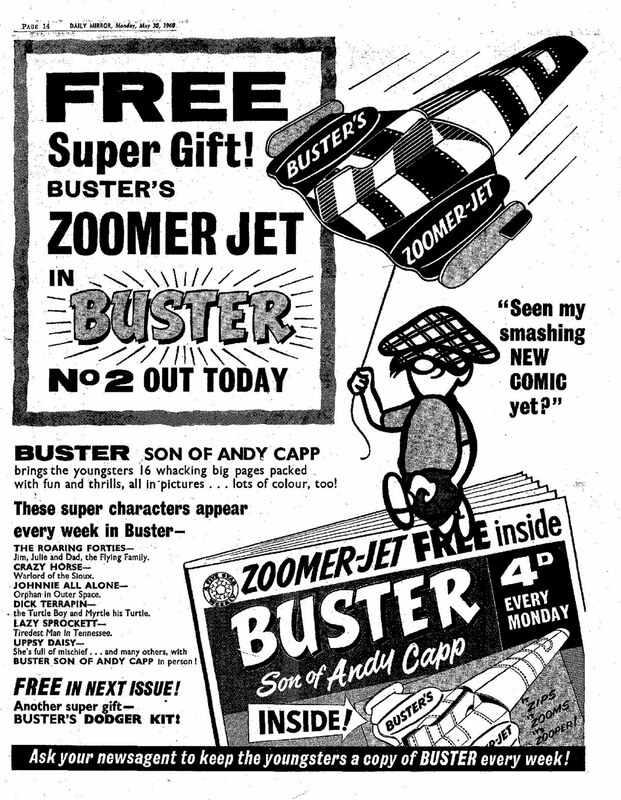 I was fortunate enough to become one of Buster's many contributors in 1988 when Oink! 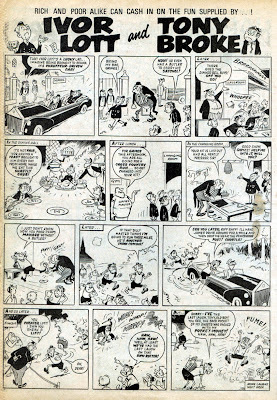 merged into its pages, bringing in my Tom Thug and Pete and His Pimple strips. Tom Thug survived in Buster as all-new material until 1996 and as a reprint for the comic's final three years. It was always a very pleasant experience to work for the comic (and its editor Allen Cummings) and I'm very proud to be part of its history. 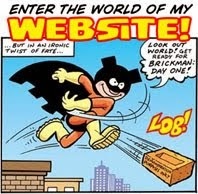 Wouldn't it be great if there was a new UK adventure comic? 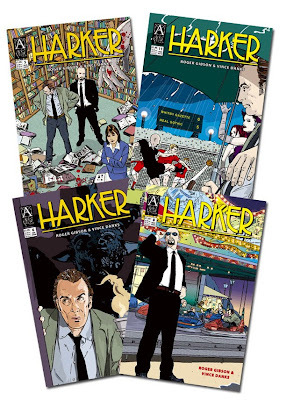 A nice quirky crime story perhaps, set in the UK, by British creators, and published every month? 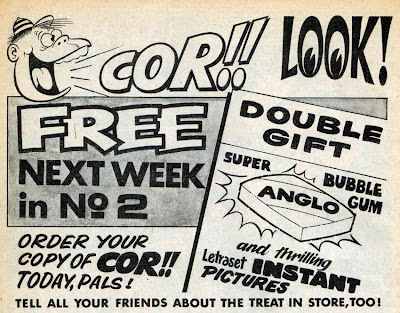 Imagine such a comic, there just out of sight, in the corner of your eye. Well, one such comic is real and has been coming out every month since April 2009 and, to my shame, I hadn't gotten around to plugging it properly on this blog until now. (Sorry lads!) 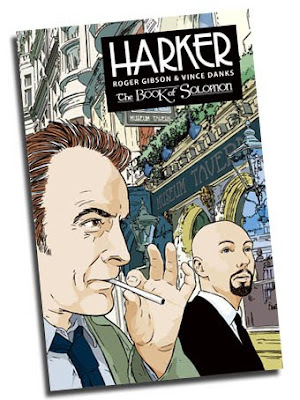 Harker is it's name and it's written by Roger Gibson and drawn by Vince Danks. Issue 12 has just been published and there's also a graphic novel collection of the first six issues to buy under the title The Key of Solomon. 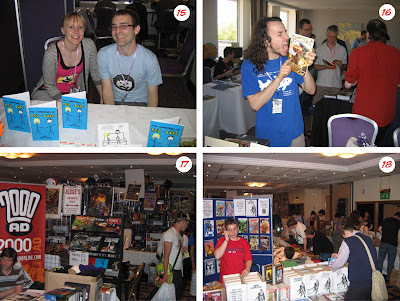 Both creators will have a table at this weekend's Bristol Comic Expo (May 22nd-23rd, Ramada Hotel Bristol) so if you're attending check it out. 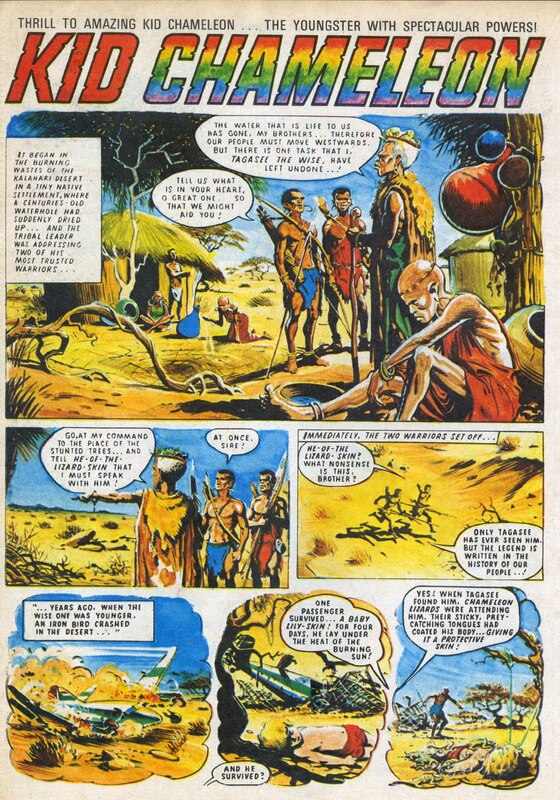 Jon Haward's graphic novel for Classical Comics, The Tempest, recently won a bronze medal at the USA Ippy Awards. 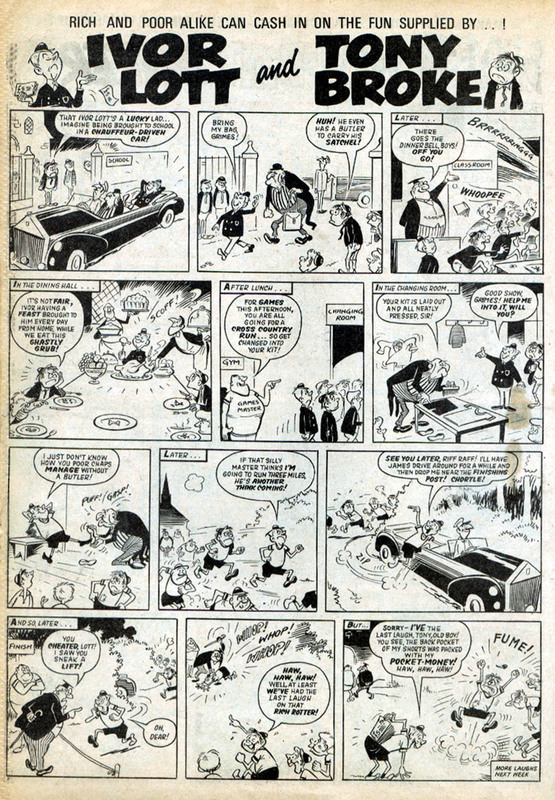 Sparky was a D.C. Thomson comic which ran from 1965 to 1977. 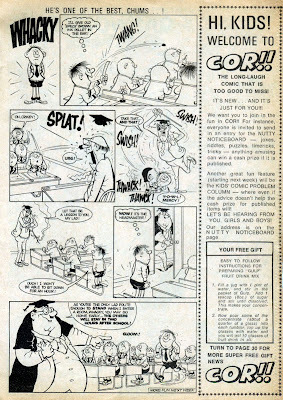 Originally aimed at young readers as a sort of stepping stone between Bimbo and Beano, it was revamped in the late Sixties for the average comic reading age but with more than average content. 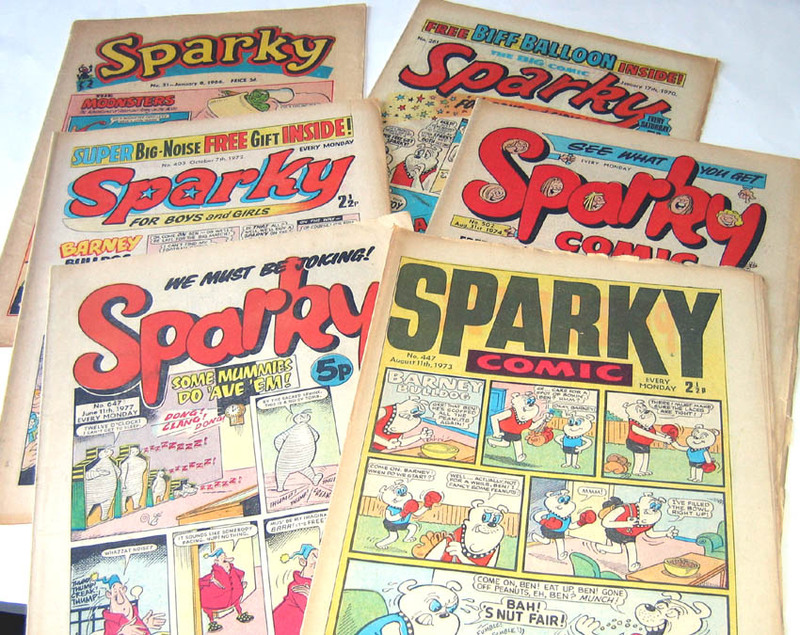 Sometimes experimental and surreal, and often laugh out loud funny, Sparky is still fondly remembered by collectors today. Now, loyal Sparky fan Alan Smith has devoted a great deal of his time in compiling a fantastic 129 page Sparky File recounting the history of the weekly. 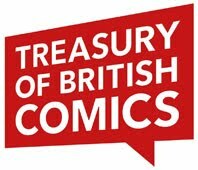 Available as either a Word document or PDF to download from the Comics UK website, the impressive tome escorts the reader through the issues, recounting each character with synopses, names of artists, and charting the many changes that the comic underwent. There's even a listing of every free gift and which issue they appeared in. Such a venture could easily have been presented in a dull and clinical fashion but Alan keeps it lively by adding his opinions and snippets of information. 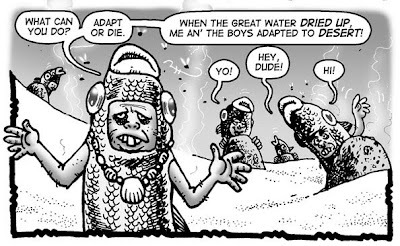 All in all it's a brilliant reference work that I'm sure every fan of this very individual comic will be consulting time and time again. 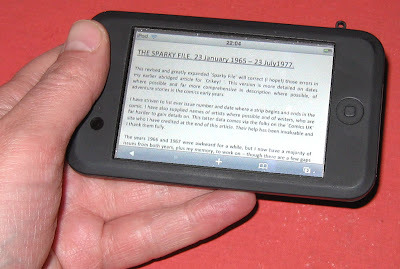 You can download The Sparky File by clicking on the links that follow. Personally I found the PDF version worked best on the iPod Touch, and the Word .doc was best for the desktop computer. 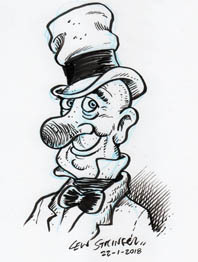 John Freeman's Down the Tubes blog has some fantastic news today concerning forthcoming titles from Waverley Books. 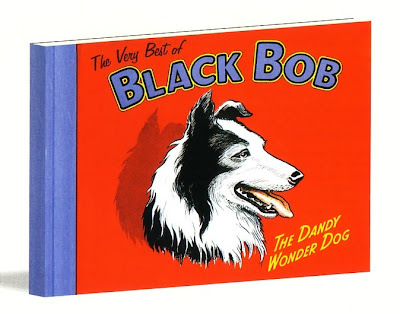 The most exciting of which in my opinion is that in a few short weeks, on June 3rd, The Very Best of Black Bob will be available to buy. This £9.99 hardback, compiled D.C. Thomson archivist and ex-Dandy editor Morris Heggie, will be in the same horizontal format as the Black Bob books of the 1950s. The famous "Dandy Wonder Dog" first appeared as a text story in The Dandy in 1944. 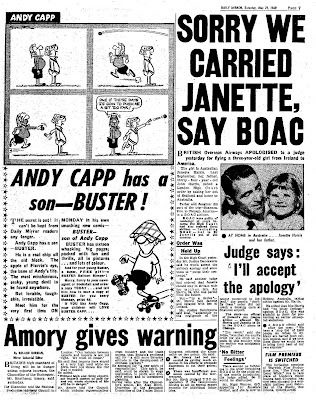 It then ran in several serials in The Weekly News as a comic strip drawn by Jack Prout, which then appeared in The Dandy from the 1940s to the late 1960s, then as reprints until the 1980s. 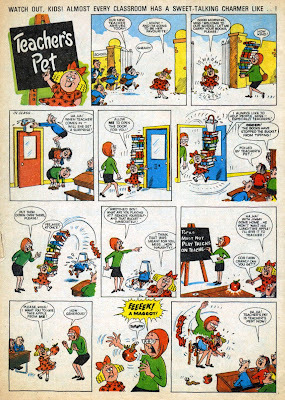 Jack Prout died in 1978. 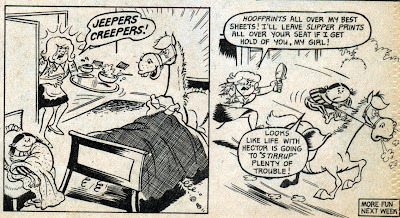 The strip adventures of the clever Border Collie and his master, shepherd Andrew Glenn were always presented as picture strips with text captions. 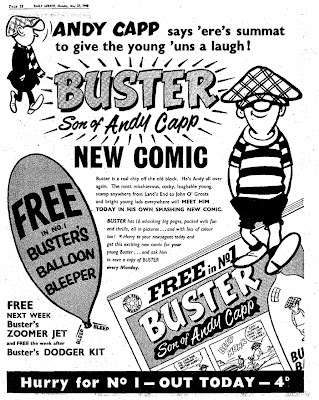 (Dialogue balloons never appeared in the weekly strips, although they did appear in strips drawn for the Dandy Summer Special.) 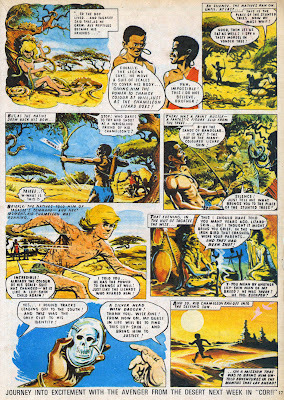 This gave the strips an old fashioned look, but it made no difference to the kids who loved the stories. In fact that was part of the charm. 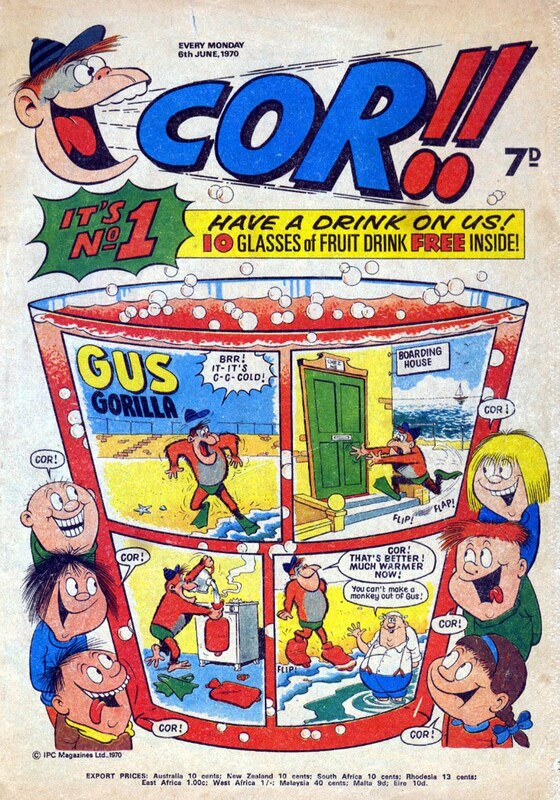 It was a firm favourite of mine as a child and I for one will definitely be buying this collection. 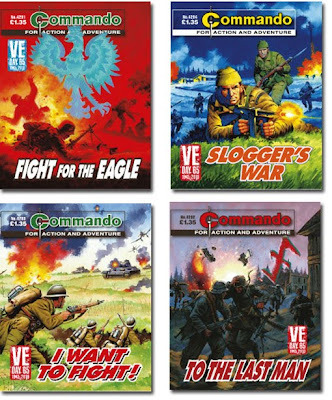 This month sees the start of the VE-Day stories. Issues 4291 and 4292 are brand new, 4293 and 4294 were originally commissioned as part of a seven-part series for the 50th anniversary and get a fresh outing here. The rest of the series will follow this month and next. 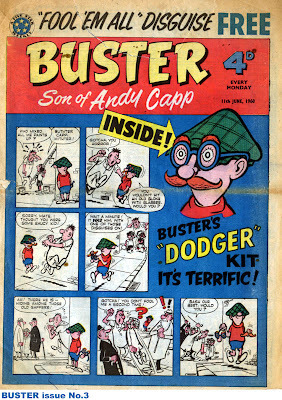 Ian Kennedy’s covers grace three of the books, two with extra portraits on the back cover. 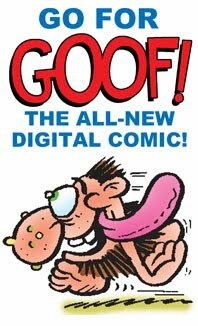 Janek Matysiak makes a welcome return as a cover artist with a new technique for his artwork. 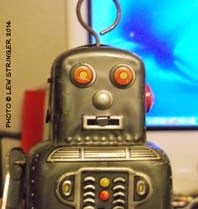 He has retrained to create his images totally digitally. We like it and were interested to hear the reaction to it. 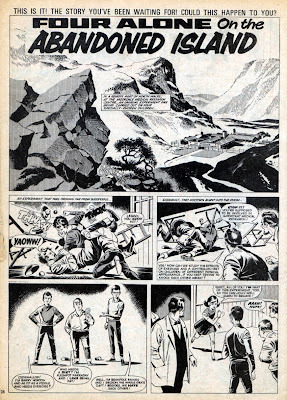 Commando stalwart Gordon Livingstone’s artwork appears in Slogger’s War — we’re sure his fans will be delighted by that. They couldn’t know then that the day of victory would come in May, 1945. Tom “Slogger” Morgan, a British Commando, was to find that facing the enemy called for a certain kind of courage — but this was not the only kind of bravery needed in the battle for survival! Titan Books is hugely saddened to report the passing of writer Peter O’Donnell, who died over the Bank Holiday weekend at the age of 90. 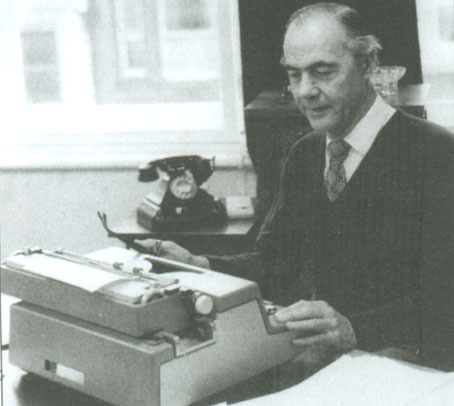 Born in South London in 1920, O’Donnell had a long and illustrious career, the highlight of which was his creation of classic crime character ‘Modesty Blaise’. 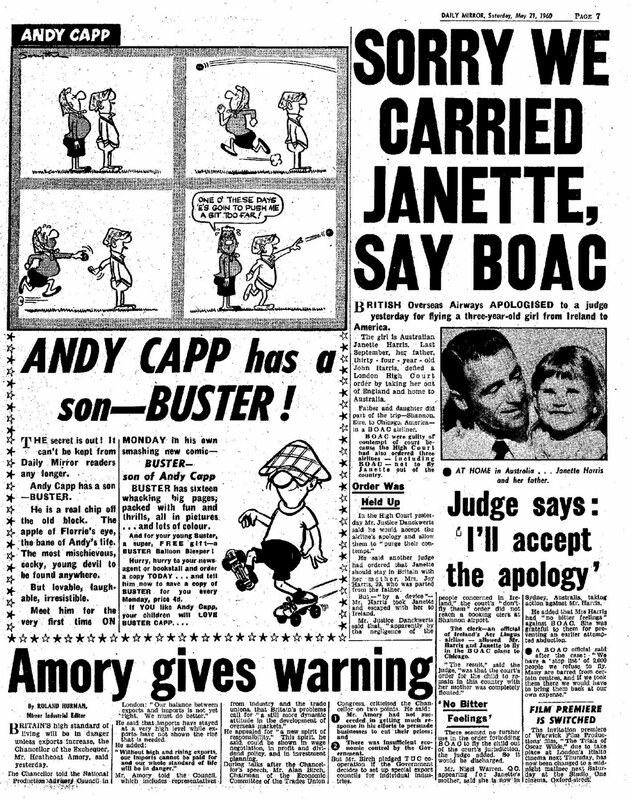 The smart and sassy comic strip ran daily in the Evening Standard newspaper during the 1960s. 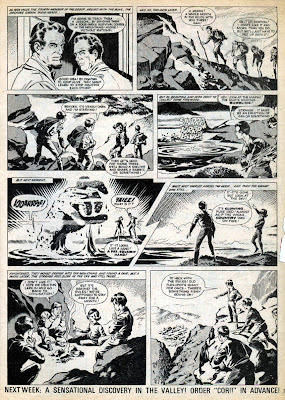 O’Donnell retired from writing in 2001, but had continued to oversee Titan’s release of more than a dozen Modesty Blaise collections, contributing introductions and commentaries to his classic stories. 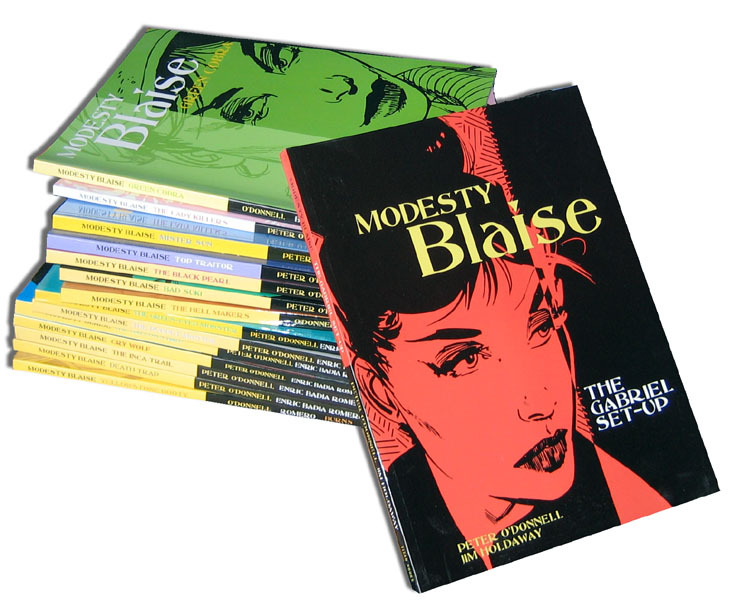 Adventurer, spy, smuggler and seductress, Modesty Blaise is the high priestess of pulp, providing crime thriller storylines with sass, wit and a touch of glamour, that have wooed celebrity fans such as Quentin Tarantino. 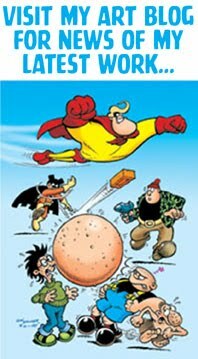 Titan Books has previously published 16 collections of the classic strip and has four further collections scheduled for release in 2010 and 2011. 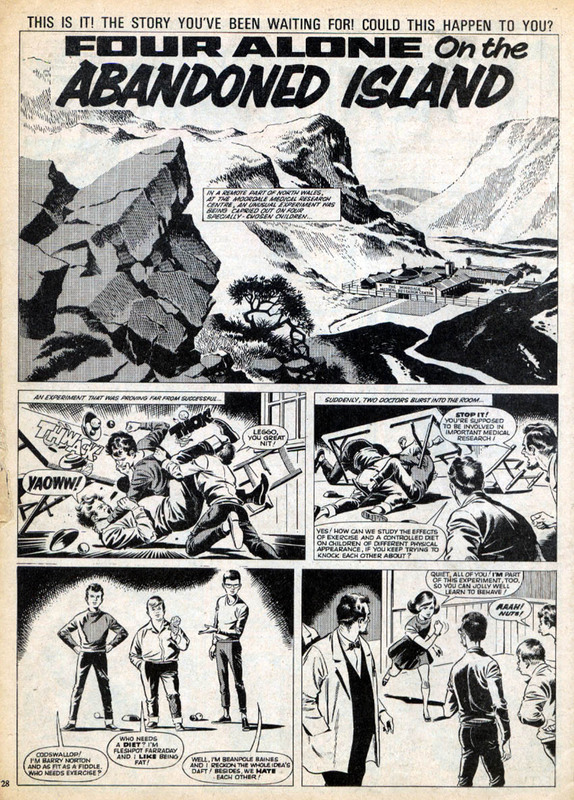 The 17th Modesty Blaise book, Death in Slow Motion (shown below) has just been published by Titan, and features strips from February to November 1983 by Peter O'Donnell and Neville Colvin. As well as Death in Slow Motion the book also includes the complete serials The Balloonatic and The Alternative Man. 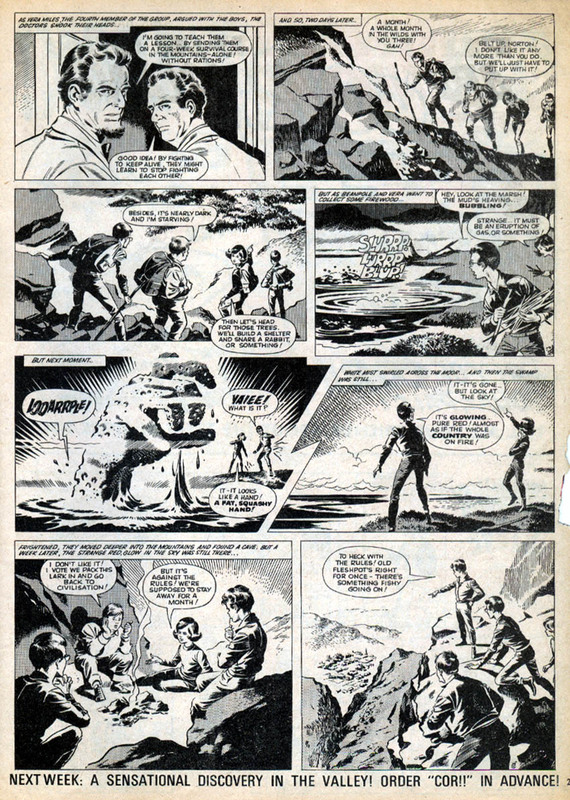 There's also an appreciation of the work of Neville Colvin written by Captain America artist Steve Epting, and Steve has also contributed an excellent piece of Modesty Blaise artwork exclusively for this volume. 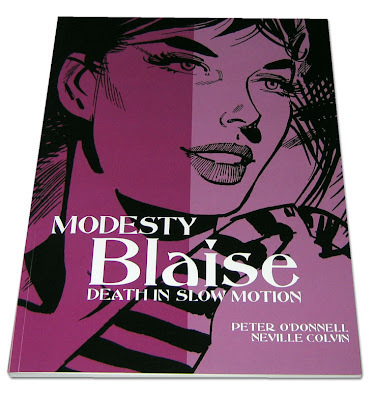 Modesty Blaise: Death in Slow Motion is £11.99 / $19.95 U.S. / $24.95 Canada.